Close Quarters: To the Sea, Mon! First boat NORA with a new coat of bottom paint. 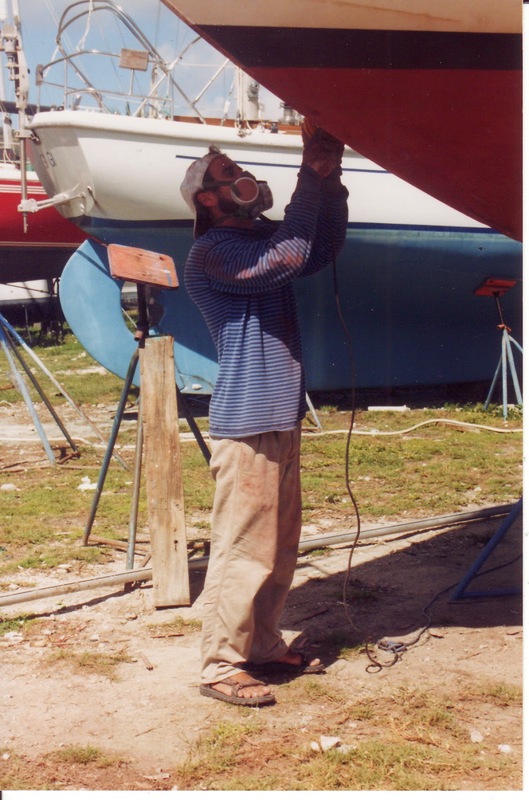 Regardless of what is above the water - paint, varnish, fiberglass, wood, sails, motors - boats need a special kind of bottom paint below the waterline. Normal paint or a lack of paint would allow all kinds of bad things to grow on the bottom of the boat. It's shocking how fast this can happen, and it not only greatly slows the boat but also can clog sensors and through-hulls. Bottom paint typically contains tin and/or copper to make it a biocide to repel marine growth. Some bottom paint is also ablative, meaning that it works by continuously sloughing off, taking any attached growth with it. Eventually of course, bottom paint needs to be renewed, and by the time we were approaching the Virgin Islands, we were past due. 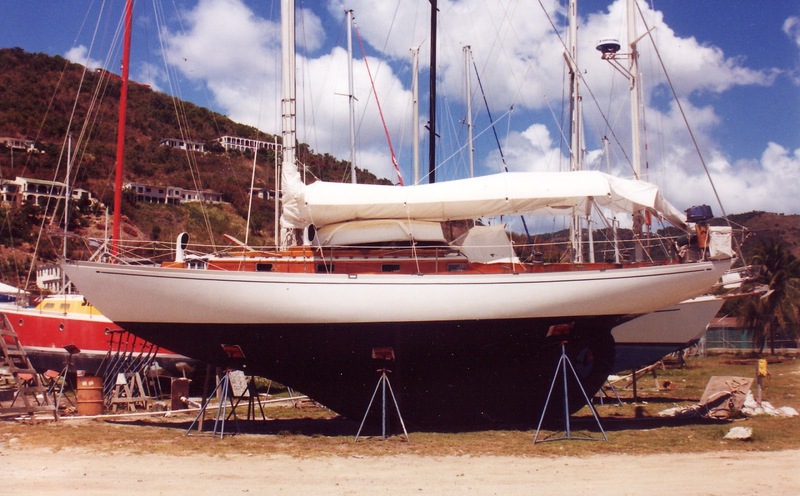 We hauled out at Soper's Hole on Tortola in the British Virgin Islands. We had no great excess of money, so we did the work ourselves. As with most painting, preparation is key, and in this case it was the lion's share of the work. It involved scraping off any growth - barnacles are especially tough, then sanding back to a sound and fair surface, then painting. This was extremely hot, hard work. It was hot because of the temperature and because there was no wind. It was also hot because, bottom paint not being particularly good for humans either, we were trying to keep ourselves covered head to toe. It was hard work because the bottom paint was pretty depleted so there were a fair number of barnacles to remove (even a small one will shred any sandpaper that comes across it). It was also hard work because it took place under the boat, so we were reaching above our heads to do the work, or we were down low on our knees, or both, or else on a ladder which had to be frequently moved. We got the bottom scraped, faired, sanded and we were ready for paint. of NORA 15 years ago. 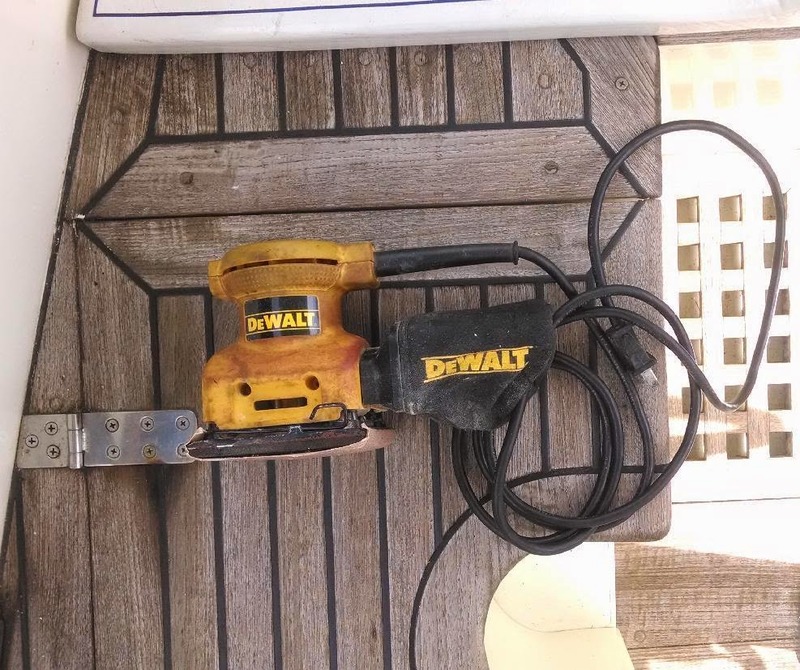 Still works well. Still red from bottom paint. my unpainted eyeball due to sweat and squinting in pain. Paula and I both were scrambling around, looking for water or for a cloth or piece of clothing that wasn't filthy when I realized Eddie the painter was yelling "To the sea, Mon! To the sea." I was a little slow on the uptake. "Go to the sea, Mon! Put your head in. Open your eyes." I ran to the nearby beach, splashed into the ocean, pried my eye open, and spent a long time letting seawater flush my eye. I think of Eddie's advice every time I see a squall. A couple of weeks ago, we were on our way out of Conch Cut heading east into Exuma Sound. Our plan was to exit the cut and make a quick sail north and then into the next cut to anchor, but it became clear as we approached Conch Cut that a large squall approaching from the SE was going to meet us there. We did not want to be going through the cut during a squall, but we wanted even less to be in the area to the west of the cut with shoals and rocks and cays. We hurried. The squall hit us about 1/4 mile outside the cut. The visibility instantly dropped to about 100'. The waves came up quickly. The rain was driven so hard by the wind that it was impossible to look into it, and we had to shield our faces. 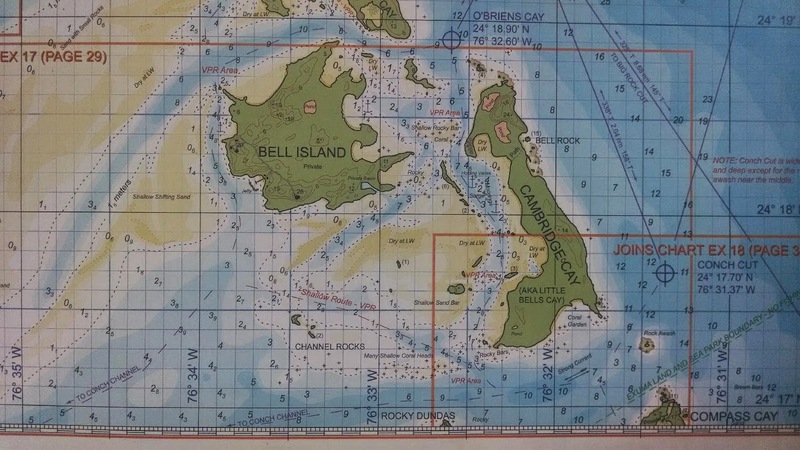 Our only goal at this point was to get away from land, so we focused on keeping the boat moving NE, which was perpendicularly away from the land. After about an hour, the squall had moved on, the sun returned, the wind was calm, and we headed back to that second cut to anchor west of Cambridge Cay. 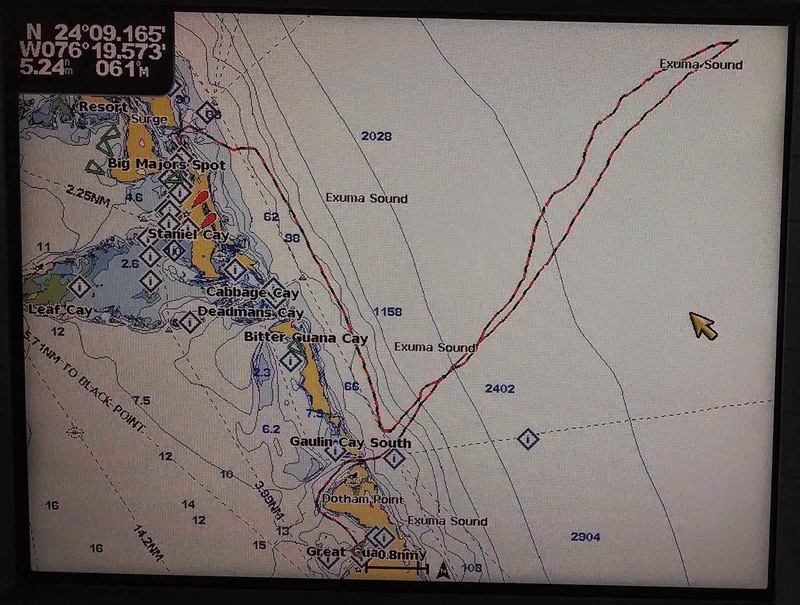 Chartplotter image showing our track. A few days ago was a similar story in reverse. We had enjoyed a pleasant sail down Exuma Sound towards Dotham Cut near Great Guana Cay, but it was clear that the large squall to the SE was not only coming our way but would arrive at the cut just before we would enter. This was a narrow cut anyway, and having no desire to be in any cut during a squall, we once again headed east into the open safety of Exuma Sound. Since we were not yet in the squall at this point, our goal was to try to dodge it and let it slip by us. We made our heading perpendicular to the direction the squall was moving (plus a little away from it). In all we traveled roughly seven miles out with the squall breathing down our necks the whole time. Toward the end, we could see the white froth of wind and rain-churned water about 1/3 mile behind us, but it never got closer. We dodged it! We headed back to anchor in a flat-calm anchorage at a very quiet Bahamian town called Black Point Settlement. To the sea, Mon! It's been the right thing in these moments of distress, and it seems to be the right thing for me in life.